The Bruery's Coton recently became just the fourth beer to earn the coveted Kaedrin A+ rating. Next up in my Bruery-fueled, liver-destroying, wallet-lightening, amazing-beer-filled winter is Oude Tart, a Flemish Red Ale aged in oak barrels. This is a descendant of Bruery brewer Tyler King's first homebrewed sour beer (which he attempted at the ripe age of 17 or 18), though obviously that recipe has been tweaked and honed through the years (I'm guessing they didn't age their original batch in giant oak barrels for a year), to the point where this was also the Bruery's first major award-winning beer. This winter is shaping up to be pretty awesome. I've got a couple more Bruery beers lined up, including one absolute monster that just arrived in the mail, not to mention a couple of upcoming bottle releases by local breweries and, uh, some other trades (no jinxing, but some other whales will be had in the next few months). I really liked this one. It was waaay more approachable than Tart of Darkness (the only other sour of theirs that I've had). I didn't take notes on it, either. I just sat back and enjoyed. I think this one is okay but I found a sharp bitterness from the oak that I didn't quite enjoy. It came and went as I drank my glass so it wasn't unenjoyable, but I didn't like it a ton. Funny enough, Beerbecue, I liked Tart of Darkness way more. However, I love vinegary (acetic) sours and Tart of Darkness was super vinegary. I have a bottle in the basement that I'm looking forward to opening at some point with my wife. Also, see you later at Dock Street Mark! That's funny, I was thinking that the oak in this was somewhat subdued... 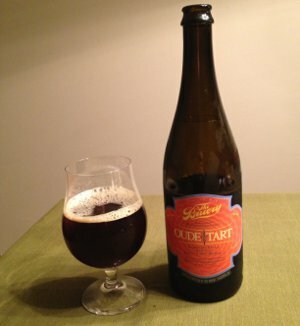 I didn't get much bitterness at all, I found it very approachable, but then, I seem to really enjoy big oak flavors! Obviously I thought this one worked pretty darn well. I have not had Tart of Darkness, but I've seen wildly divergent opinions about it. Beer Samizdat rated it a 3, but I've seen it get raves from a bunch of other people. Quite possibly a mix of bottle variation, draft variation, and palate variations. I find sours to be a poor overall categorization since they can taste so different. But, now I just annoyed everyone that thinks beer is already too categorized. This page contains a single entry by Mark published on November 19, 2012 10:00 PM. Novembeer Club was the previous entry in this blog. Duck-Rabbit Rabid Duck is the next entry in this blog.